It’s been 29 weeks since I first made this avocado and cucumber salad, which means two things: it predates this news, meaning that all of my theories about this kid making me crave avocado, grapefruit, and chocolate are perhaps completely bogus, elaborate projections on my part. Two, I’ve probably made it 29 times since then and never shared it with you, which is a huge shame. I’m clearly addicted to it, but every time I went to take a few photos and write it out in recipe format, I convinced myself it was too simple to make a big deal of. You know, as if what anyone has ever asked for in their life is more complicated recipes and fewer 5-minute salads worth obsessing over. I first spied it on the side of a plate on Instagram and my reaction was immediate and three-fold: why isn’t this in my life, give it to me, and I want it now now now. Fortunately, Julia Turshen is not only a talented food writer and recipe creator (nbd, just co-authored Gwenyth Paltrow’s cookbooks, Buvette’s, and has her own coming out next year), but a friendly human being who explained to me that she made the dressing with a mixture of mayo, lime juice and sriracha and I was pretty much in the kitchen before she’d finished typing. There’s been so much chatter in recent years about the glories of avocado toast (I, too, am a convert but I’m also just as happy to let Café Gitane make it for me) but so much less about what an flawless combination avocados and cucumbers are. One is rich, the other is snappy, and they play off each other perfectly, like carrots and hummus, artichokes and lemon or radishes and butter. They’re as welcome piled on, yes, toast as they are on the side of a plate of tacos or grilled fish. I made a massive bowl of this for my family’s Seder on Friday night and based on how fast it disappeared, I suspect I’m not the only one who enjoyed a brimming green break from the traditional brisket, kugel and bread of affliction, rendered into various formats. Not sick of me yet? Here are a few articles that have run recently where I talk about things slightly outside the recipe scope of this site: a bit about my kitchen in The Guardian, career advice on Cup of Jo, on why I continue to hate packing lunchboxes on Food52, how I “organize” (ha) my pantry (and baking pans) on The Kitchn, a bit about matzo crack and recipe attribution in Tablet Magazine, and an ode to the caramel cake in the archives on Food52. Okay, now I bet you are! This salad is gluten-free, dairy-free, chametz-free and vegetarian… but you should make it anyway, heh, because it’s fresh and green and totally hits the spot. It also takes about 5 minutes, tops, to put together which means that you can make as much of a habit of it as we have. There are a ton of ways to adapt it, too. Last Friday, I added some thinly sliced Romaine hearts for bulk, but still left it predominantly a cucumber and avocado bowl. I added the scallions, not Julia, but if they’re not your thing, skip them. If you’re not into lime and cilantro or parsley, try lemon and dill. If you’re not into mayo, try using yogurt. Or, skip the creamy dressing entirely. You could make a Tex-Mexish variation with minced jalapeno, olive oil and ground cumin, or a Japanese-ish version with a dressing of toasted sesame oil, miso, rice vinegar, ginger and garnished with toasted black and/or white sesame seeds. And if that’s still not enough to get you started, be warned that salads this simple might lead to you to add another dish, and then another, and then you might have as huge of a Spring feast as we had on Sunday night. Don’t worry, I told the family not to get used to it. Combine cucumber, scallions and avocado in a bowl. Whisk together mayo, lime and seasonings, adjusting levels to taste. Drizzle salad with dressing and garnish with cilantro or parsley. Repeat again tomorrow. Any tips on selecting perfectly ripe avocados? I’ve been striking out consistently and am almost giving up on avocados (although I ADORE them). Hold the avocado in your hand and push with your thumb, if it dents without feeling mushy it’s perfect. The ripe ones won’t be bright green either, starting to get dark or already dark. Pull the little “belly button” off of it- if it’s green inside, you’re good! If it’s brown, leave it. Works every time. Hi Deb, I have been craving a lot of avocados recently as well. I’m not a huge fan of mayo. Is there something else you can make the dressing with? She suggests using yogurt, if you don’t like mayo. I’d even use sour cream. I use Chobani nonfat greek yogurt and it is GOOD. Addicting. Amazing. I made it with a hot sauce, lime juice, ground cumin and olive oil and it was very tasty. Oops… Saw that you already have the answer in the post. Picking a ripe avocado — I like to feel for ones that are firm but give slightly (i.e. think one of those rubber Pinky balls) when squeezed, but don’t hold a dent, suggesting that they’re mush under the surface. If it’s underripe, a day in a paper bag at room temperature will usually make it perfect. If it’s already ripe, make sure to keep it in the fridge until you’re going to use it. Oh, and if you’re in NYC, can we talk about how much the fact that Westside Market regularly has 3 avocados for $5 (what counts as a good price on this coast) has increased my avocado consumption? This sounds wonderful. But whenever I make salads with avocado, the avocado chunks break down and make the whole salad mushy, grayish, and unappealing. How do you avoid this? Do you use underripe avocados? I have only recently started using avocado on a regular basis and am always looking for ways to use them. Thank you for sharing this recipe, I can’t wait to try it! I’ve been hoping you’d post a recipe for this for awhile. I might have done some Instagram stalking (in the least creepy way possible) awhile back to remember what all was in it, then never made it. I still consider the avocado cucumber toast from your book to be one of the best things that’s ever happened to my avocado toast game. And being from California, I have some serious avocado toast game. Kristen — Aim for a firm-ripe one (see my tips in Comment #5) if you’d like it to stay in chunks. I also only drizzle on the dressing. Once it’s mixed, some of the texture gets lost. This looks absolutely amazing, and I don’t even really like avocados. Pinning for the future! yummy! I love how simple this salad is! only 5 ingredients and I’m sure it tastes amazing! Re. picking avocados: a friend once told me that you should always pick an avocado that still has its little wooden bud attached at the top. Apparently that helps prevent it from getting overripe. No idea if this is true, but I’ve followed the advice ever since! For the mayo-averse of the world, do you think that substituting greek yogurt or creme fraiche would suffice? To Westside market I go then! I have also been majorly failing in the avocado department. Was starting to doubt my abilities of picking a good one, though I think it’s the supplier :) the one in your photo is absolutely perfect! Picking avocados: Aside from firmness, I was always told that if you lift off the wooden bud at the top and look underneath, you should be able to see a green tinge in the little bud hollow. This generally means it isn’t overripe. Since I started doing this, I haven’t bought one bad avocado! I swear, you know exactly what I want to eat. I’ve been craving avocado all week! I’m skipping the mayo and using lots of lime juice, salt, and pepper. I might add red onion too…this is starting to sound like guacamole. Yum!! All my favorite foods in one bowl, which I can eat with a spoon. Happy Tuesday to me! Do you think buttermilk would work instead of mayo? I made your broccoli salad for Easter and now have leftover buttermilk (which I’ve already used to make the raspberry buttermilk cake but am still trying to use up). So good! I used vegenaise instead of mayo to make it vegan, and then put it on top of lettuce. It. Was. Awesome. Ok, I’m not a good cook. But this cuke and avocado salad is totally going to help,me pass myself off better than I am. I’m better with play doh actually and stopping at chipotle. I love how flexible this salad is!!! I made something so similar today, but I need to get some chilli sauce! mimi — Ooh, buttermilk sounds so good here. Picking avocados — I’m amused that one suggestion is to look for ones with the stem/bud still attached and another is to remove it and see if it looks good underneath. I don’t think I’ve ever bought one without (I wouldn’t either, mostly because I’d imagine it would mold there quickly) but I probably wouldn’t remove it, only because it reminds me of when people half-open husks of corn in the summer to find the best one, frustrating farmers (and shoppers like me!). I know this is an old post so I’m not sure you’ll see this, but I just had to comment. The only way to find out I if you’re buying good corn and not bringing home a bad surprise is to pull back the husks and look. I don’t know anyone who doesn’t do that. In fact, all the places I shop at put a box or trash can next to the bin of corn for people who want to pull the husk off completely to have a place to dispose of it. Of course you only do that to the ones you’re actually going to buy, but peeling back the husk a bit to see what the corn looks like before you buy it is the only thing that makes sense if you want to be sure you’re getting good corn. And who doesn’t want the best they can find? Another way to pick the best corn is to chose the heaviest ears–this method has never let me down. Not true, the ear should feel heavy in your hand when you pick it up. How do you remove the pit? Do you have some cool, safe way that doesn’t involve holding the avocado half with the pit in one hand while hacking into the pit with the giant sharp knife in your other hand?!?!?! To remove the pit/cut up avocado — My technique looks mostly like this. I feel you on the avocado and cucumber combo! it’s so underappreciated… whenever I get sushi I always ask for avo and cucumber in the same roll. Separate? Yeah, pretty yummy. Together, though? Magic! Also congrats on all your success and sharing your wisdom across the blogosphere. Totally love that matzo crack article (one of my all time fave desserts and interesting perspective on recipe development/originality) and on the caramel route, your caramel cake looks sinfully delicious. Deb- how does the salad look next day? I’ve tried lots of avocado salads and squeezing lemon over them seems to help for a while. But by day two, it always turns grey and unappealing. Is this an eat-it-all-day-of-making kinda thing? Wanted to use up some tzatziki dressing and saw this — threw in some tomatoes & fresh dill – wonderful! 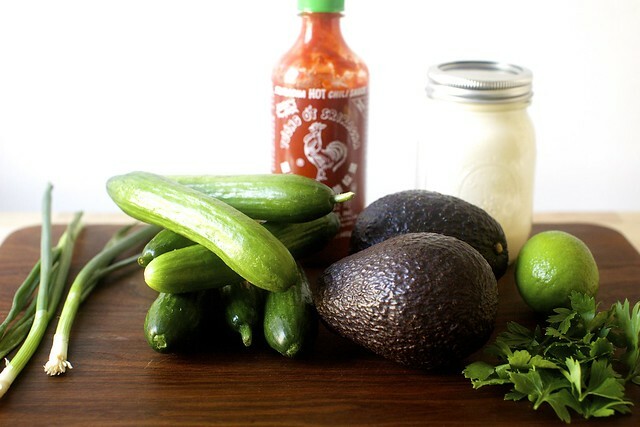 Looking forward to trying the lime/sriracha/mayo dressing. Interesting. I JUST returned Buvette back to the library. I had borrowed it because I read rave reviews of it on another blog. I have to admit I wasn’t bonkers for it. To me, a lot of the recipes weren’t so much recipes but ways of presenting vegetables, like steamed with a little bowl of something or other to dip them in. I’ve also borrowed Gwynyth’s books (we’re on a first-name basis, you see) from the library — I can see ideas from those recipes in this salad, like her green dressing with the mayo, avocado and cilantro. Will definitely make this one — Lilli is nuts for avocado “Ah-co!” so we have slices at nearly every dinner — and she’s pretty good about sriracha, having enjoyed deviled eggs made with the sauce at a recent party we went to. Making this for lunch! For the record, I live a stone’s throw from where huge amounts of commercial avocados are grown, and they’re still usually at least a dollar each, even at the farmers’ market. I hope my new little tree produces lots this year! I just recently discovered those cute tiny cucumbers that you used. Can’t wait to try them in this recipe. Sometimes the simplest recipes are the best. Thanks for sharing this one! This looks amazing, a more stripped down version and the best parts of what’s become my most favourite salad, Heidi’s ‘Orzo Super Salad’ over at 101Cookbooks: http://www.101cookbooks.com/archives/orzo-super-salad-recipe.html. I’ve made it many times without the orzo, and the dressing here with lime and mayo sounds delish. Cucumber and avo are totally brilliant together. Thanks for this! ashli — If you stir the dressing in to coat so that the avocado doesn’t brown, it keeps very well. And even better if the avocado was firm-ripe. Molly — Interesting to hear. I haven’t spent a lot of time with the book but I have in the restaurant. It’s adorable, and the food is simple but delightful. The ambience is a big part of the charm. I’m not sure how that would translate to a cookbook. That said, the new place Jody Williams and her partner opened in the West Village, Via Carota, has almost immediately become my new favorite restaurant, and we’ve only been once so far (will remedy this soon — anyone want to babysit? heh). I would buy a cookbook of the small plates alone. Try using greek yogurt instead of mayo. I’m not a mayo fan either and greek yogurt has less fat & calories if you’re watching those. Makes it a little more tart but that’s ok with me. I JUST made a spring quinoa and edamame salad with the lovely avocado and cucumber combo, so I am so intrigued by your recipe. It’s so simple yet so beautiful! I’ve never been a fan of mayo after a scarring experience of eating mayonnaise soup as a teenager, so I think I may substitute some full fat Greek yogurt for this. Thanks for sharing! Read this 30 minutes ago, checked my fridge (miracle of miracles, I had everything I needed! ), made lunch 5 minutes later, and was eating 5 minutes after that. “Obsessively good” is definitely a fitting description for this salad. Never incorporated avocados into my salads but this looks delicious. Cant wait to try it the next time I’m lacking other condiments. Also great some people who are on low carb diets. Awesome work! I will always and forever be a fan of yours, Deb. I’m eager to see what’s in store in your next cookbook and so happy for you expanding family :) I agree, cucumber and avocado go wonderfully together! I like someone else’s suggestion of using Greek yogurt instead of mayo, since we rarely have that in the house. This looks tremendously delicious! I thought I’d share a tip I learned from a gentleman on a flight (who learned from a farmer at the market in Orange County)…press gently on the bottom of the avocado (not where it attaches to the plant, but the bottom). If the bottom has give, that means the oils, which are delivered from the stem-attached side, have made it all the way through the fruit, and thus it is ripe. This hasn’t failed me yet! Hmm. Thanks! I tried that with mayo and eggs in an avocado egg salad situation and it was so sad grey the next day I almost cried. Will try this though. Looks so yummy. I grew up eating avocados, and they’re still my favorite food. Some tips: think ahead. Buy hard and green, with the end of the stem on. Put them on your kitchen counter to ripen – 1 to 3 days or so, depending on how green they are. This avoids all the bruising they get from getting squeezed in the market – and from anyone who has taken off the stem end. When they feel very slightly like they give a bit when you very lightly squeeze them, stick them in a plastic vegetable bag in the refrig. They will keep for a number of days – often over a week. Cut around lengthwise. Open. Take a soupspoon and slide it between the flesh and skin to get it out of the shell whole. You can cut it however you want then. Keep the seed in the half you might not need! Stick it in a little ziplok in the refrig. It’ll be fine for at least a day or 2. To get the seed out of the other half, which is still in its skin, hit the seed with the cutting edge of a knife, and since the knife sticks into it, you can lift it out easily. It’s the seed that keeps avocado fresh and green. If you make anything with mashed or small chunk avocado, put the seeds back in the mix to keep it fresh, either in gracomole at the party, and also when you store it in the refrigerator. They look kind of neat and they do the job well. Simple is a good way to describe the recipes, but I kept on finding myself saying “Is that all there is? They needed to make a cookbook for these?” Of course, nothing comes close to the exasperation I felt when I got my hands on the Prune cookbook a few months ago. Gah! Blood, Bones and Butter was outstanding, but the cookbook was just argh! This reminds me of the avocado & cucumber toast in your (first) cookbook, which is a total go-to for it’s delicious simplicity! Molly — Been watching Mad Men?! And yes, I ask myself that question all of the time, sometimes even multiple times a day (re: my own cookbook, and whether the current recipe I’m working on is or is not worth buying a book for). Then again, maybe cookbooks aren’t really selling recipes? I wish someone would tell me, because this recipe work is exhausting! On the issue of good avocados: More than anything I hate getting an avocado that seems like it will be good but is all black and icky inside. A tip that hasn’t yet failed me is to make sure the little stem nub is still attached. If it has fallen off, air can reach the inside of the fruit (if you look where it was, you can see avocado flesh) and make it oxidize. 1. selfishly, i’m wondering.. what else did you have at your seder? i tried to plan a non-traditional brisket/kugel seder this year and am curious what was served at other seders! 2. i live in the city and would definitely babysit. granted i am now working full time during the week, but weekends are always open. seriously though, if you ever need a babysitter (i can provide references etc.). Thank you, thank you for my lunch today! I just had this salad with some of your recommended adjustments based on ingredients I had on hand (lemon and dill instead of lime and cilantro), and it made a delightful accompaniment to my baked sweet potato. Curious that you would advertise this as vegetarian, since mayo has eggs in it…..
Oh my goodness, I didn’t even pick up on that. Total Mad Men junkie — I think I read that they’ve used that song three times on the show, so it’s some sort of record. We actually watched it in real time on Sunday night because we couldn’t handle the idea of ignoring the internet the entire day to make sure there’d be no spoilers. That cookbook debate from last month was so interesting to watch happen in real time. I really enjoyed reading good writing about good food writing. And I had actually only learned of Manger through your blog. So many feelings about that one. So. Many. Feelings. I have been obsessed with cucumber and avocado salad. I have been able to buy locally grown cucumbers at the farmer’s market lately and it’s made all of the difference! Morgan — As far as I understand, something with eggs can be vegetarian; it cannot be vegan. Or, this was the definition for the 15 years I didn’t eat meat. Sara — It was my parents Seder, so not my menu. Fairly traditional, brisket, matzo ball soup, these “rolls” my mom always makes (that we call “hockey pucks”), a sweet kugel, a vegetable kugel and I made a potato-artichoke gratin (we’re not strict about dairy), my MIL’s eggplant caviar and this salad. LOL – what is the deal with pregnancy and grapefruits+avocados? I swear I ate through 4 entire cases of grapefruit, truckloads of avocado (uncountable, really) and enough unsweetened vanilla soy milk to drown a horse. My husband was prepared for late night White Castle cravings (a 90 minute r/t drive, mind you)… but we’re convinced that we simply blew the produce manager’s mind once I had my son and ALL GOOD EATING CEASED. Nuts. Definitely add FETA CHEESE!!!! Thanks for the recipe! We here in California’s Central Valley have avocados all year. You might want to suggest Haas avocados rather than the smooth skinned (I don’t remember what they are called). Haas avocados generally have better texture and flavor. Feel like the odd man out, commenting here, as it looks like I’m one of very few guys… but, like everything else here, this salad looks great. My wife is no fan of cilantro, so we’ll try alternates. On the ripeness of avocados, great tips already… And maybe someone added this one… But another Is ve seen is to pick off that nib at the end and check the color. It will match the color inside. Never ever worry that a recipe is too simple to offer! It’s the simplest of all recipes that attract me. If recipe is even mildly complicated…I push it aside as I don’t have enough time nor energy left after my long day to cook. This recipe is perfect! Thank you! You have me laughing so hard with “bread of affliction” – who wouldn’t choose this salad when faced with that, it sounds so tempting!!! Kugel I could eat ( the cinnamon one) until I burst, this salad too, but “bread of affliction” (hahahaha) makes it sound even more like sawdust than it is already. Love it with liver on top though… or your mushroom pate if I could eat mushrooms. I toss my avocado with lemon juice before mixing if I don’t want it to turn grey. That salad looks wonderful and I have been craving avocados. makes me wish I liked cucumbers! Alas, they are one of the few foods that i aggressively dislike. Do you think it would work with bell peppers instead? A ripe avocado should have the same give (on the stem end) as the tip of your nose, and still be a little green on the outside. Do.not.squeeze.avocados.ever! If it’s bright green, it’s not ripe. I only buy them unripe so I can avoid the fingerprints left behind by the squeezers. Yum this looks amazing! And with Sriracha? Hell Yeah. I’d eat this like a salsa with corn chips! i just finished making it and it’s yummy! New way to eat avocado! I make a similar one with watermelon and red onion instead of cucumber and no mayo. It tastes like a perfect summer! I’ll definitely be trying this one as well, though! I adore cucumbers AND avocado. This looks amazing. I love that it is dairy free, but I cannot stand mayonnaise! 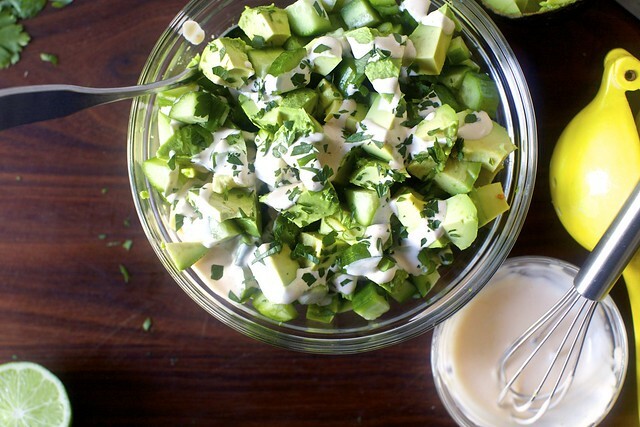 I’d probably make a creamy dressing using avocado, cilantro & jalapenos rather than adding any additional oils! Yum! This looks amazing and I love that it’s so fresh! I bet the dressing would be good with tahini too! Great recipe. My grandparents were avocado farmers in Florida and this is what my grandmother would call “gussied up” avocado salad. Theirs was splitting an avocado in half and squirting Persian lime, salt and pepper on top. I thought this salad couldn’t get any better when I first tried it. Then I remade it without adding any mayonnaise and instead added shredded chicken and it was tasty and super filling. I grow avocados and the reason that little stem is there is so the fruit doesn’t give off a gas that will have it ripen too fast. This way they can store them longer. If you want them to ripen faster pluck it out and put it in a paper bag with an apple or a banana. Thanks for sharing all the links to your other articles! Go you. 5. Made your roast beef and tomatoes a second time! Smashing success. Oh avocado! Here’s my avocado secret recipe (everyone has one, right? ): Avocado slices + peanut butter + toast + a squeeze of lemon. GO MAKE IT NOW! Just sayin’. Delicious recipe, especially the lemon/dill variation,with feta. Deb I made this yesterday but it looked nothing like yours. The sriracha turned the mayo a light orange-brown and the cucumber/avocado was drowning in sauce. Your photo looks so light and fresh, creamy white sauce, and very little of it. It tasted just ok but looked so unappealing. this looks so simple yet so delicious!! As a former Californian this one speaks to me.I second the suggestion to buy only Haas avocados. I think of the other ones (big and smooth-skinned) as Florida avocados, and they just don’t compare, imho. One of my relatives lived on a former avocado ranch, and when I moved to the East Coast she shipped me a big box of avocados. Unfortunately, what arrived was a box of avocado mush. I am pretty sure I cried. Great salad! Thanks for sharing even though you were hesitant! One thing, you state that this is dairy free, but the mayo would be considered dairy right? I made this last night to go with Moroccan Chicken thighs and it was amazing! I added some halved cherry tomatoes and a bit of ground sumac. 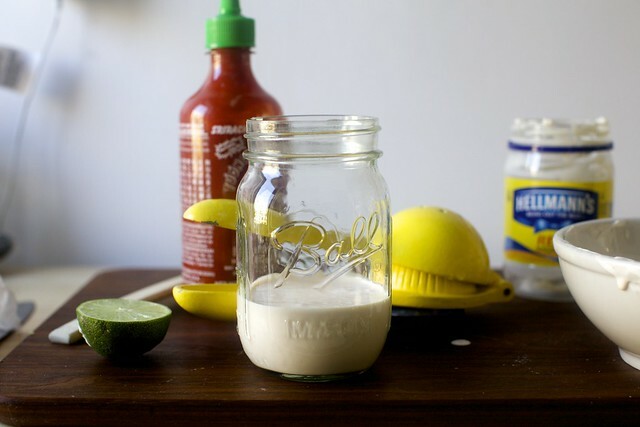 Did you know that there is such a thing as sriracha mayo (?!) which I used (half /half with canola mayo) Spicy and delicious! This video pretty much sums up how to buy Good, Ripe Avocados. Ever since I learned and adapted this method, I have not wasted money on avocado purchases since then. California roll in a bowl? Love reading your site but I really get excited when I recognize a recipe of yours printed somewhere else – like in Food52’s Genius Cookbook!!! Great recipe choice!!! Love your site, your writing style and photography. Congrats on #2! And can’t wait for another cookbook! Last night at 10:30, I got home from a very long day at the office, and I made this (I added some chopped cooked chicken breast because protein and a lot of freshly ground pepper because pepper). Half an hour later, I made it again. Also, I still have most of a bag of avocados and a three-pack of English cucumbers from Costco, so I’m pretty sure what’s going to be for dinner tonight. And the mayo-lime juice-Sriracha dressing combo is going to become a standard for me on a lot of salads. Perfect timing Deb…I have a bag of avocados that I bought to introduce my 6-month old to avocado as his first food. He is not sure yet whether or not he is a fan (still has a very strong tongue pushing reflex), and just this morning I was trying to think of something new and fun to do with them for the adults in our house. YUM! Can’t wait to try this! Absolutely saving this recipe! It looks so good and perfect for a not-so typical item to bring for the upcoming month’s cookouts! by telling me that avocados can be stored in the refrigerator. Intil that moment, I had thought they were like bananas and must never go there. But I did know that the best way to tell if they are ripe is to squeeze, ever so gently, around the stem end. If they have a little give, they are just about there. A lot of give and they are bound for the guacamole bowl. Marlene — Salt and hot sauce are listed together in the ingredients. Taya — No, mayo doesn’t have dairy in it. It’s supposed to be only egg yolks, oil and sometimes a little water or lemon and seasoning. Aileen — Sorry to hear. My dressing definitely has an orange tint, but of course, you’re adding hot sauce to taste and with more, the color will be more pink. I’m sorry if it was unclear that you should add the dressing to taste; you may not have needed all of it. anu — Thank you, I will definitely try it. It is so, so gross right now. Running it through the washing machine did nothing, nor did stain treating. You think my tolerance for filthy stained things would be higher, being a parent and all! Jennifer — It’s matzo crack(ers), heh. It can be made with Saltine crackers, too. To say this looks amazing is an understatement! I love the cookbook Julia did with Gwyneth Paltrow and would love to see anything else Julia would cook. I literally have everything at home right now to make this salad. I think I will make it tonight to go with taco night. I might skip the tacos! Made this last night for a quick dinner and it didn’t disappoint! I added some halved grape tomatoes and some canned tuna for protein. I’ve got more cucumber and avocado in the fridge, so I may try the recipe as written tomorrow night. Looking forward to it! Do you leave the Avocado skin on when you cut it in chunks? I’m a big fan of salads with avocado – to think I didn’t even eat them until well into adulthood. I might have to add this to my meal plan for next week. I just made this for lunch. So good. I vote for more 5-minute salads worth obsessing over… thanks!! Just read your article on lunchboxes and I want to say amen. Just wait until you have multiple lunchboxes to pack and, of course, all of the small owners of those lunchboxes will turn up their noses at different components. (One of mine wants all oranges all the time and the other won’t eat anything that has touched an orange, for instance.) Also, why have I never thought of digging out the egg slicer for my (8-year-old) gadget man? If there’s a gadget involved, he’s all in. We’ve had to guard the wine ever since he discovered the corkscrew, and we had a long conversation just yesterday about why little boys can’t drink coffee…right after he got his hands on the manual coffee grinder! 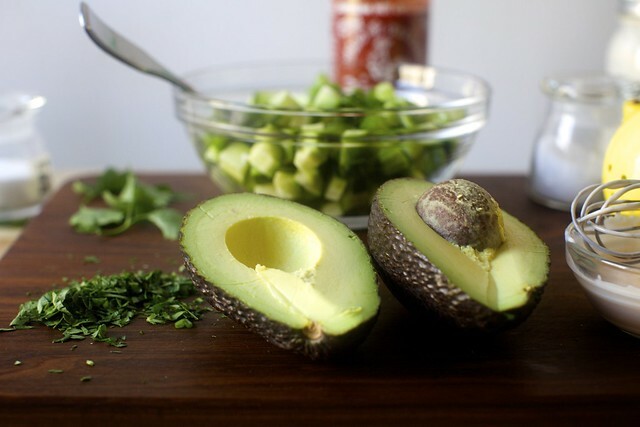 Kathye — I like halving, pitting, and then scoring the avocado into chunks while still in the skin. Then, I use a metal spoon to scoop out all of the chunks at once, running it along the inside of the skin. Does that answer your question? Hope so. This looked so good that I made it right away! Delicious! I love it when I can put a first time recipe into the heavy rotation category, I can tell we’ll have this a lot over the summer months. Just made this for my lunch with a couple of variations…delicious. Greek yogurt, Tapatio, and sweet onion. Definitely be adding this to my menu. I have been on The Daniel Plan to lose weight and this will fit right into that plan. Thank you. This was lovely, I wanted to have it with toasted pitta but had run out so mixed some quinoa through it which was good. deb, I’m finding the controversy over the 2 cookbooks and the reviewer fascinating (comment 51). the article you link to has a well thought out argument as well as some good comments to add to the conversation. I just made this (with a big handful of roasted salted shelled pepitas, and using homemade stick-blender mayo, which is worth the 3 minutes it takes to make and clean up) and ate it in romaine boats. I’m struggling to save my husband some for dinner. This recipe sounds great! I make a similar dressing for “south of the border cole slaw” Which has shredded cabbage, carrots, radishes and cilantro. Great on fish tacos! Eggzicutor–that’s what we called our egg slicer, although I’ve never had to spell it before. Love mayo and cukes, will try this soon. This recipe sounds delicious! I am obsessed with avocados and I could eat an entire cucumber in one sitting.. Putting the two together is deliciously dangerous! I will certainly be trying this one out on the fam soon!! This looks insane in the best way! I am totally trying this dish. I love when you find a good recipe and you have all the ingredients on-hand to make it. For Texmex may I suggest Valentina hot sauce which is fantastic on mangos too! Definitely making this – I have 2 avocados sitting on my kitchen counter ready to be put to good use!! Amazing! I glanced at the recipe just before heading to the store. What a treat to be able to make dinner in 5 minutes once the babies were in bed. It was a delightful, fresh explosion of flavor. I stopped after eating half but could have easily consumed the entire recipe worth. The two pioneer glories of life. Avocado and Cucumber in one glorious salad concoction. And topped with Sriracha! On the wheels to the grocers this minute to toss this one up for the pre dinner plate! Hi Deb! I just read your article about packing lunch. I love the lunch box/pre-divided tray that was in your photo. Would you mind sharing the brand? Thanks! Reeves — The lunchbox is from PlanetBox. It’s held up great so far, but it’s definitely expensive for what it is. We won’t really know how good of an investment it was for a couple years, I think, but we hear they last a long time. The carrying case for it has held up less well; I can’t seem to get it clean and think I’ll just cave and replace it in the fall, begrudgingly. France — I agree, it’s a very interesting conversation for anyone who reads or writes cookbooks. I know both of them — Adam and I are both old-school food bloggers and I’m quite fond of him, and I met Mimi and her as-charming-in-person family for breakfast when they were in town recently — so I’m hardly a neutral party here, but I think Helen Rosner nailed it, that all cookbooks are in some way a packaged story/image. * And I think that for women, self-presentation in the public eye is all the more complicated and loaded with double standards. I don’t think it’s wrong to question the authenticity of glossy images put before you, but if we’re only doing it for female-authored cookbooks, we might want to look inward at why. sfb — I have not, sadly. I sometimes wish I had a commute only so I could be a person who listened to podcasts (like Serial! And all of the great food ones.) It just doesn’t work for me in the kitchen as background noise. Deb – on the avocado skin removal technique. I half the avocado length ways, remove the seed (just by using a sharp knife, hit the seed and it will lift out), then cut them in half again (skin still on), then you can actually just peel the skin back and voila – you have perfectly intact quarters. So easy!! I’m totally going to make this. It sounds like an even better version of one of my favorite indulgences: sliced avocado with lemon juice drizzled on top, dusted with sea salt and cayenne pepper. Re PlanetBox: We’ve been using our PlanetBoxes for 3 and 2 years respectively, and they have held up great, save for a little stress on the hinge from overfilling. We love to use silicone cupcake cups and glasslock containers to separate foods that sometimes need separating. The best part of the PlanetBox is that we have a “system” for what goes in each compartment, so my husband and I can share equally in the lunch packing duties without much coordination. YES! This will be on the side of my plate this weekend!!! Really like the dressing…the tang is much tangier with lime juice then the usual vinegar. So good with avocado. Thanks, Deb! I read about the salad last night,couldn’t wait to make it.Delicious! light and oh so tasty!don’t know why somebody asked if its good the next day!LOL! sorry, no leftovers! Cucumber and avocado are a great combo! Add cream cheese for an awesome sandwich. I love putting honey and sriracha on avocado. I bet making a dressing out of honey, sriracha, and lemon (and maybe olive oil) would be delicious on this too. This salad was great. I used Greek yogurt rather than mayo, lemon rather than lime, and added in some chopped radishes. I served the salad with warm pita and your shakshuka recipe. Delicious! Avacado + cucumber is one of my favorite combinations. I usually just pour a little italian salad dressing over them. I will have to try this recipe. I read all the articles about you and I loved them. . . but please don’t start charging for your recipes online! I made this salad last night. OMG, fantastic!!! Will definitely be making this again very soon (maybe tonight). Made this last night, and it was delicious! Had the leftovers for lunch with some shrimp and a little squeeze more of lime juice. Even more delicious! Amazing salad!! As we would say in French ‘C’est une tuerie !’ I’m just finishing a bowl as I write this and I’m sure to do it again very soon. All this green-ness is very welcome for spring and I’ never have thought about using Sriracha in anything other than Asian cuisine. That’s why I love your blog! Made this salad chopped more like salsa and served with shredded romaine on fish tacos, delicious! Love your recipes. SO good – I should have bought more cucumbers so I can eat it again tomorrow. This reminds me a lot of your Avacado Tartine with Cucumber and Sesame Seeds – which I adore! I was just thinking about making sure to get cucumbers on my next shopping trip and now I’ll have to try this, too. Thanks so much for the new recipe. I’ve made it four times since you posted it. The PERFECT spring salad. And my 3-year old can’t eat it fast enough! Thank you. You said obsessively good and you were right. I went to be thinking about this salad! We ate it on tortilla chips. Yum! I am waiting for my avocados to ripen for the salad of them and cucumbers. So, while anticipating that salad I remembered cucumbers and strawberry salad, with a simple vinagrette. I hope you will experiment with this idea. Or maybe it is just so passe that you won’t. This was delish. I served it with Ottolenghi’s turkey/zuccini meatballs and Stacey’s farro. I don’t know what I would do without you all! added smoked salmon and mango to this wonderful salad. They go so well together! Any recommendations for swapping out the mayo with something else? I’m not a big fan of mayo and would think the avocados are creamy enough? Didn’t think this salad was rich enough with the chunks of avocado and mayo based dressing so I added organic white corn kernels and bacon, LOL;). It made a lovely light dinner with a base of chopped romaine underneath all the goodies. We were eating popcorn too and one of my guests said the popcorn made fantastic croutons. Thanks for the great idea! I made this the other night for a “spring is here! (and ripe avocados are on sale! )” dinner. Trusting Deb that this recipe is very flexible, since my girlfriend doesn’t like mayo I subbed Greek yogurt, and she’s not a Sriracha fan either so I dropped that. As usual, I didn’t use scallions because I just sub with a handful of chives from the garden. Didn’t have parsley or cilantro so skipped those entirely. And it was great! Sooo light and tasty. My only advice is (as I think Deb kind of says at the end but I didn’t totally get it) to store the dressing and salad separately if you have leftovers (there was just the two of us so we did have some extra! I’m sure that’s usually not the case…) Stored with the dressing on my salad got kind of goopy and overly lime-y…still totally edible but not as completely delicious. Thanks for another great recipe! I’m drooling over the carrot-graham cake…that’s next, I hope. I made this the other night after bookmarking the recipe a while ago. I didn’t have mayo so I used fage total. I almost ate the whole thing before anyone got home. And the first words from my boyfriend (a man of few words) were “this should be a staple.” And so it shall! This was delicious! I’m going to add a sprinkle of black sesame seeds next time to add a little more texture. I have found that if you cut the avocado and place it in salt water it prevents it from turning that unappealing grey/brown color. Just drain the salt water off when you’re ready to combine the rest of the ingredients. Works every time. So, for tonight’s batch I used sour cream instead of the mayo and added a pinch of garlic powder. The sour cream brightened the flavor a bit, and it’s actually pretty good. I’ve recently discovered a quicker way to get cubed avocado… I cut it in half lengthwise, and score lengthwise and width wise. Then, I hold the avocado with my thumbs on the cut edges of the skin and push with my fingers on the center of the skin side. Basically, I pretend I’m trying to invert the curve of the skin, and voila! Out pop perfect avocado cubes! No spoon required. I craved chocolate when I was pregnant too but only when I was pregnant with my son. I had no chocolate craving when I was pregnant with my daughter. Congratulations, girls are greatest! Even though I love my son to pieces, it’s nice to have another female in the house. This was amazing! Added some homemade baguette croutons, green pepper and edamame and nixed the mayo because I couldn’t refrigerate it for lunch. It would have been great to have a bit more of a lead-in and a bit more of detail for this extraordinary recipe. English cucumbers or Persian cucumbers or the plain ordinary ones? Deb, this just made my day. YUM! And NOMS x 1,000!! You have to try it with hard boiled eggs. ZOMG this is delicious! I used yogurt instead, and a green habanero sauce (in keeping with the green theme). I cannot wait to have this on a blazing hot Baltimore summer day. And the variations are endless: watercress or dill for parsley,green zukes in high summer when they’re plentiful. ZOMG thank you for this! This is a solid keeper in my book! This sounds amazing and will probably make it into tonight’s dinner! If you haven’t tried this combo yet, grapefruit and avocado salad is delicious. 1 avocado, half a grapefruit and a little salt sprinkled on top. The grapefruit takes the place of lime juice while also adding a bit of sweetness. It’s definitely a warm weather favorite. beautiful pictures,I will definitely try this out. Omg I just made this!! I used Korean gochugang (spicy red pepper paste) instead of Sriracha and it was amazing! I’m making it again today for lunch. Thanks!! hi deb. i love your website. i’ve made so many things from here that are now staples in our house, such as the cocoa brownies and the broccoli slaw, that i’m passing them off as my own. even though it has all things i love, but i felt like this salad was a little flat for me. probably just some bad avocados. that being said, i did eat most of it in one sitting. what does that say about me. thank you for sharing all your great stuff with us, especially when you are busy growing a human. Deb, this is delicious. But I should qualify that I made heavy modifications to the salad. Mine was an avocado and half-sour pickle salad. I used mayo, lemon, dried parsley, and paprika for the dressing. It rocks. =) Now I’m tempted to throw eggs in it, like someone did up the page. I am allergic to mayo, so I usually substitute plain greek yogurt with a tsp of lemon or lime juice for mayo. Okay, I NEVER would have thought to pair avocados and cucumbers. Even though I love both. Starting today, I will pair them together as often as possible. Thanks for this revelation! I’m amazed at the number of comments for what you thought was “too simple” of a salad but when the true taste of something comes out with very little fuss, it’s definitely something to be celebrated! Like many other commenters, I too somehow never thought to pair cucumbers and avocado together but boy was I missing out! I “pre” pickled the cucumbers in a dressing somewhat off beaten from yours — mayo, rice vinegar, sugar — then combined with the avocados just before serving and placed over a bed of romaines. The dressing sounds weird but the kids gobble it up like it’s nobody’s business and it’s an incredibly un-fussy dressing to make for last minute meals! Thanks for the eye opener!! Not to belabor the point, but I am indeed obsessed with this. Just finished it at my desk and wondering how I can get away with licking my tupperware clean without too much side eye. I added some shredded rotisserie chicken for protein… and literally just had the thought about hard boiled eggs when I saw Maya’s comment above. Looking forward to devouring this on an at-least-biweekly basis…. plus my hopefully 10 lbs lighter bod as a result! I made this today and added diced jicama because I had some. Wow – so good! Thanks for the recipe. Yummmmm! I’m glad I’m not the only one obsessed with cucumber and avocado. I make a similar salad with cucumber, avocado, feta, basil, mint and dress it with just lemon juice and olive oil. OBSESSED!! Radishes and butter with a pinch of good salt, mmmmmmmmm. So many people look at me like I’ve lost my mind when I say that. Just finished eating this and I have to say, I love that it was so simple! I feel like sometimes bloggers feel that a good recipe is one with a gajillion modifiers in the title…who has time to bake that on a week night?? I added some celery, radishes, and pepitas to mine and served it on a bed of butter lettuce. I subbed chives for the scallions since that’s all my garden’s growing right now, but it was still delish. Made a great side to some grilled salmon. YUM! Thanks for your amazing recipes, as always, deb! Big hit here at my house; used parsley but think the cilantro would have been better. Didn’t realize there could be so many comments about getting a ripe avocado! Used the Haas variety, needed two as they don’t tend to be very large. This was a huge hit at a BBQ I went to last weekend. So delicious and so easy. Thanks for the great recipe! An additional idea – include chunks of mango for a little extra tang and 4-5 grape tomatoes (sliced) for color. Thanks for terrific recipe idea. AMAZING. Made this today and served it with blue corn tortilla chips. Thank you for another great recipe!! Great recipe – a real power-house of nutrition! Avocados are such a brilliant source of potassium – great if you don’t want to eat bananas – they actually have more! This salad is fantastic. I’ve made it quite a few times; thanks for posting it. This looks so good and perfect for summer! good in the name but you should have mentioned that you need to double recipe if ore than two people are eating….So good. Thankfully, this is most delicious with greek yogurt instead of that vile mayonnaise stuff. Great salad! Love this! I have made it dozens of times since seeing the post. I served it on the side with grilled fish and discovered it is a perfect topping for white fish and recently tried it with salmon–just as good. Thank you for posting what you thought was too simple. I love your site, it is now my first stop when looking for a recipe. This was amazing, thank you! We added tomatoes and served it with bbq chicken. I will definitely make it again. Honestly? it was ok. I love all the ingredients, but nothing here really popped. I think next time I will add more lime and more sriracha – and a titch more salt too. The mayo and avocado were too much cream for my palate and it needed more acidity to balance. But cucumber season is on the way and I will be experimenting with this one! This is so completely simple that it amazes me I don’t see it served everywhere. I’m blessed to be living in a country with year-round amazing avocados. They’ve become a staple in my diet and I’m consistently looking for affordable and easy ways to prepare them (I’m a lazy cook). I used yogurt instead of mayo and it was delicious. Thanks for the ideas! I can’t wait to toy around with this recipe more and more! Thank you for sharing this recipe! It will provide me with a reliable, minimal-effort way to make sure the cucumbers and avocados I’ve been craving and buying have a purpose and won’t be forgotten due to lack of inspiration. Your blog is such a positive part of my (food)life. How about adding lemon and feta then toss some sprouts for a unique additionally fresh crunch? Just made this last night with persian cucumbers and it is DIVINE. I will make this many, many times this summer. Just made this and included some sliced radishes only because they needed to be eaten.What a great salad! This kept for 2 days in the fridge & was yummy both days. The 3rd day I used an immersion blender to turn it into a cold soup. My husband deemed it restaurant-worthy! I want you to know that you titled this recipe perfectly- I now have a fantastic way to use up all the cucumbers in my garden. I have served at several parties this summer and it has been a huge hit!! Was a favorite at our4th of July BBQ- Thanks for sharing!!! I may have just inhaled a large portion of this for lunch. We were in eastern Europe for two-plus weeks and while there was incredible food and drink involved, there was nary an avocado in sight. I used the little persian cucumbers, Meyer lemon juice (we grow them), and flat-leaf parsley. I added a sliced hard-boiled egg cause I forgot to have any protein with breakfast. Oops. I made this for the first time last night and now I’m kicking myself for waiting so long to have this fabulousness (though, I did make a double batch and am so glad b/c lunch today was leftovers). I decided to serve the sriracha on the side so that each person could adjust the heat accordingly, but otherwise stuck to the recipe. So, so good Deb-thank you for sharing and for making yet another of our meals enjoyable. avocado, grape tomato, lime, cilantro, toasted pine nuts (for crunch! ), a touch of olive oil and a high-quality, fire-roasted red salsa. Put it in tupperware and shake it lightly to mix and the avocado chunks keep their shape. Sometimes I skip the oil. I was ready to make this, and just as I had already cut the cucumber and made the dressing I realized my avocado was bad. I remembered I had two ears of fresh corn in the fridge, so I cut the niblets off the corn and substituted that in place of the avocado. It was nice! I added some cotija cheese on top and it took on a more Mexican flair. I am dying to do with avocados thoughl. Big hit at the dinner party I took it to tonight! I wish you would add a Paleo tag. Paleo Paleo Paleo! Yum. Oh what have you done? This is so good! I usually only stand over the bowl in the kitchen and snarf down chocolate frosting (before the teenagers sense the chocolate, overrun my kitchen, and I am left with nothing). I have NEVER done that with a salad!! I wanted to stab my husband’s hand with a fork when I saw him going in for seconds. I didn’t do it, but I wanted to. Delish! But as long as we’re juicing a lime, how about we zest its peel into the dressing? I did, and believe me, it was not a mistake. Omg!! Just made!! This is SO good! Non nom! Unfortunately, hours of trying to fix it later…I have come to realize that the skins of the cucumber I used are so bitter that no flavor has overpowered them…not sesame seeds, walnuts, cream cheese, parmesan, garlic, carmelized onions…. Going to probably have to throw away the aftermath of an attempt to use otherwise great ingredients. So, I recommend peeling the cucumbers. I did not see that in the recipe. Apparently, some are more bitter than others!! Dont repeat my mistake! here’s a link on flicking avo stems to gauge ripeness – i have to say, it has never failed me! Made this with vegan plain yogurt instead of mayo and it was awesome. Made it with vegan mayo as well and it was good. Made this tonight, added some fresh ginger, soy, fish sauce and extra lime; used on crispy fish tacos. Outstanding. Another winner!!! Didn’t have a ripe avocado so I used black beans (rinsed). SO good. Also used lemon juice because didn’t have a lime. YUMMY. I did add some minced garlic and a bit of garlic salt with parsley as the garnish. Hubby raved. Thanks! So easy with roast chicken and jasmine rice! And champagne of course. This looks soooooo amazing but, I can’t do mayo. Could I successfully sub yogurt or sour cream? Another lovely addition to my “avocado toast” repertoire! I thought that was the most bizarre breakfast thing I ever heard of but, boy, is it good! Tried your “Japanese-ish” variation and it was delicious! Added a splash of soy sauce in addition to your suggested dressing ingredients. Also way more sesame seeds than is possibly seemly or appropriate. Every bite coated in tiny nutty crunchiness, YES. We love this salad. The first time I made it I told my husband I was making the salad for dinner and he started pulling all the veggies he could find in the fridge for our usual garden salad. I got a little frantic and snapped “No! I’m making a specific salad!” He laughed, “Well la-di-dah. Don’t let me interfere with your SPECIFIC salad!” So now that’s what we call it. Everyone gets excited when they see Soecific Salad posted on the kitchen menu board. Thanks for another favorite! After sharing this recipe with my sister-in-law (consequently makings addicts of both her and my 6-year-old niece) she mentioned that she’d started making it with Wildwood Garlic Aioli (found in the refrigerator section of my Whole Foods) and I’ve never made it with mayo again! Great recipe- one in which I will try several adaptations and change-ups mentioned here. One tip – about ripe avocados. In addition to firmness, look for little brown nub on the end. For perfect ripeness, it should come off easily. I usually buy in bulk – at least one or 2 ripe ones, then a few that will ripen over the week. Saw this on Facebook and knew that I had to make it. My son loves cucumber salad, loves avocados and has just discovered the joys of Hot Sauce. It was a huge hit! I think he tried to lick the bowl. I had a stick of celery out from something else and added that to it. Aside from tasting amazing, it looks beautiful too. This will be making an appearance at our seder table this year. Thanks! Will be on regular rotation at our house for sure! I have to say I knew this recipe was going to be good, and it still exceeded my expectations! I will say I’ve made several variations and my favorite is with Greek yogurt. I seriously have made this at least twice a week for the past month and as it gets warmer I don’t see slowing down! This is one of those recipes in my forever rotation! Avocados don’t ripen on the tree and are necessarily picked rock hard. A good green grocer or market will put the avocadoes out when they are at or about to ripen. Squeezing avocados is not a guarantee that you have a ripe avo. After 47 other people have given it a squeeze in the store, more likely you now have a bruised avocado. The best way to ensure a ripe avocado is pick a firm avo a couple of days ahead of time (before the squeezing damage). Second option is flicking off the “cap” at the stem of the avocado – if the avo underneath is green, you’re good to go. If it is green, it’s not rip, and if it’s yellow it’s too far gone. If you really want to squeeze, squeeze top to bottom. Could you give rough measurements for how much of the various seasonings we would need for the Tex-Mex and Japanese versions? My family members are not big on cilantro or hot sauce, but the other two versions sound like something they would love! This has been on my list to make for a while and I finally got around to trying it tonight. Man is it good! I forgot the Sriracha so I definitely need to try it again with it. I wish I had doubled the recipe! One way to prolong the life of cut avocados is to scrape off the outermost green later, the part closest to the skin. That’s the part that oxidizes and turns brown/gray, so get rid of it! Just made this, but accidentally added a little extra dressing and tons of oven crunchy croutons. It’s so good I can hardly stand it. OMG this is so good! I’ve been taking the “Repeat again tomorrow.” instruction seriously every time I read it and hence I’m eating a whole bowl of this daily for lunch! Might be a good recipe, but the format is not worth reading to find out. A clear concise list of ingredients would be helpful. You could use your imagination. It’s not rocket science. Last week a few stray chunks of mango from my quinoa pilaf happened to get mixed into the avocado salad on my plate, the combination is unbelievably delicious! Now I am cruising the grocery store every 3 days to get more avocado and mango so they can ripen together and feed my addiction. Oh my word, y’all… made this 2 times in 3 days it is that good! Now, sharing it with my momma who loved it as well! We aren’t a fan of spicy, so we omit the hot sauce and throw in a pinch (or 5) of garlic powder instead :) Delish! I tried the main and Japanese minus miso versions. I preferred the latter but wasn’t terribly excited about either one (admittedly, my sesame oil was a few years old). I did just try Mark Bittman’s cucumber salad with fish sauce-lime dressing and scallops (or chicken / halibut), which was awesome. I added the recommended bell pepper and upped the greens quantity. I believe scallops are out for Deb, but it’s a great recipe. His Asian cucumber salad with broiled chicken and peanut sauce is quite good, too. (And I am a bit leery about semi-exotic flavors.) Both are in The Minimalist Cooks At Home (phew, took a while to find the old cover and confirm the title). What should be the consistency of the dressing? Runny or creamy…? On the runnier side is a little better, or it will feel thick/clingy against the avocado. This is now my regular go -to lunch salad! Just love it! When I first made this I accidentally left out the scallions and thought that the salad was fine but didn’t have much personality. Then I remembered and added the scallions, and wow, what a difference! I’m not usually a fan of scallions, but hey provided just the right amount of zing. The salad was really quick to make, especially since I used the trick of cutting the avocado in half and then dicing it while it was still in the shell. 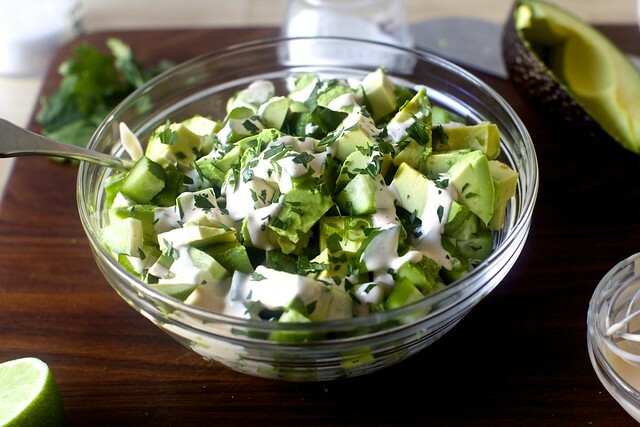 It’s a great salad for anytime you have good avocados. This is the bomb, just made it for dinner! Perfect as is. Deb, I think you should order comments so that older comments appear on top, that way you can easily see the most UTD comments on a recipe. This was so good and got really good reviews at a LDW bbq I took this to. For making ahead of time, I would recommend tossing the avocado and cucumber in lime juice before storing it in the fridge overnight, and then tossing it fully with the dressing the next day just before serving. The lime zing does lose its potency after sitting! Someone brought this to a cookout over the labor day wkend. She had add the romaine. Was so good, can wait to make it at home! I’ve been eating this on a daily basis since the cucumber vines went nuts. I’m always sad about the yummy saucy bit left at the bottom of the bowl. Even though it isn’t Passover, I found that some crumbled matzoh worked to turn this into an excellent, still Passover-friendly, Panzanella sort of a thing. Plus, the extra crunch is a nice touch, imo. where has this been all my life!!!!! and my 2.5 year old looooooooooooves it too! thank you for taking the plunge and sharing this one with us. I’ve made this again and again since it was first shared last year. It is literally the greatest summer salad. I even brought some to dear friends as one of their mid-summer postpartum meal deliveries…they made a point to tell me how much they enjoyed it. Holy deliciousness! This is amazing! Thank you! It seems this is an older recipe but it is very welcome since I don’t have to save it for winter. Avocados are in season in Aus and are so healthy. I am not a big fan but I like cucumbers a lot and by the time I add herbs and seasonings I won’t even know it’s there!! And best of all it’s a cold dish. No heat required. Thank you. I just made this with spiralized cucumber noodles (new years resolution purchase!) and some chicken (also, no lime, subbed sherry vinegar) – totally satisfying “noodle” bowl experience. I have also made it exactly as written, delicious. You weren’t messing around when you called this obsessively good, we’re you? I’ve made this 5x in the past week. I never ate avocados except in Guac but this recipe gives me confidence to try it in other things. This recipe is amazeballs, thank you! This recipe is delicious, fast and easy to make. Totally recommend. Made this just today, with more scallions and loads of dill as the herb instead of parsley or cilantro. Yum. It was so good. We had the salad with salmon and oven feta. A new favourite meal is born. Thank you for sharing this recipe. The lime-sriracha flavor definitely worked better (so refreshing!) than, say, the sesame miso dressing from Deb that I love. I used greek yogurt instead of mayo, and it worked perfectly. I don’t love creamy/heavy dressings, so I feel like mayo would’ve been almost too heavy for such a refreshing dish. Greek yogurt is light enough in taste but creamy enough to coat the vegetables super well. Thank you Deb for an idea to toss together a meal in 10min from prep to eating! I am making THIS! Thank you! Greetings from Lithuania. It’s one of my favorite salad now! Thanks for sharing! I made this last night and it was as delicious as it looks. I had some fresh parsley on hand, so I used that instead of cilantro. The dressing was deceiving–on its own, it had some kick, but once combined with the cucumber and avocado it calms down. I will make this recipe often. You are right, this is addictive! Since I found this recipe three weeks ago I’ve made it almost every day. Instead of the sriracha, I put sesame oil and rice vinegar in the dressing (I used Kewpie mayo), plus a lot of roasted sesame seeds, and a generous sprinkle of roasted brown rice (iri genmai) just before serving. The iri genmai made it crunchy and nutty. Now, if I could, this is all I would eat. I love this, and had forgotten about it since last summer. Thanks for the reminder! I predict it will be a weekly (if not more often) addition to my summer meals. This is such a great quick salad. I didn’t change the recipe at all, and it was perfect. I can see this becoming a summer staple. I Can’t Stop Making This!! I use all cilantro, and to make it vegan i swapped in homemade cashew cream. To make one portion i use one full cucumber but just half an avocado, i just save the extra dressing for the next day! I liked adding in cubed smoked tofu and a handful of sunflower seeds to make it a meal. Made this for New Year’s Eve; since we were taking it to someone else’s house, we precut everything but the avocado. Made the dressing ahead of time, I was worried it was too limey but by the time we put it together for dinner, it had mellowed and was excellent. Used parsley which is what I had. A taste of spring in the middle of a very cold winter. Lovely! Just made this, and I can say that it is, in fact, obsessively good. I used lemon juice vs. lime because that’s what I had on hand, and sprinkled some ‘everything but the bagel’ seasoning from Trader Joe’s over the top… o-m-g. Absolutely will be making this again and again! This salad, but with whole-milk Greek yogurt for the mayo for my peeps that can’t safely eat mayo, simple and wonderful! I was thinking sour cream instead of mayo-or maybe one tbsp each. We just bought 12 Haas avocados @ .59 a piece! & I am getting a wee bit tired of avocado toast, so the appearance of this recipe was perfect! I usually only like cucumbers in certain situations, but I am pretty sure that this is one of the situations that will work for me, yah! Seedless cucumbers are European, right, often sold wrapped air tight in clear wrapping? Jealous of your avocado prices. Seedless are usually wrapped in plastic, yes. Enjoy! Just made the Japanese inspired spin off of this and it was amazing. I may have finished the entire bowl. I dunno, it’s possible. Thanks for your comment, I didn’t know there even were spin-offs mentioned! It’s truly obsessively good! I made a Japanese/Asian-ish version, using lime juice, toasted season oil, salt, Korean red pepper!, and furikake, an amazing addition to many, many things—and keep making it, over and over. It.is.sooooo.good! Thank you for this recipe. This is delicious. I just made it with Trader Joe’s Green Dragon Sauce. My husband said he wanted to eat the whole bowl of it. I love simple salads like this, thank you. It also got my brain going with all the different yummy salads I want to create now. Thanks for the delicious recipe, even if I’m late in finding it, and the inspiration to create more delicious salads. This is really good! And I don’t even like cucumber. Everyone I served it to raved about it. We use full-fat Greek yogurt instead of sour cream in sour-creamy situations, I bet it would be great with sour cream or some of each sour cream/mayo. I have been making this for a while now, love using your pickled red onions in it. Here’s how it plays in our house: (1) 11 yo boy: Well, I’m eating the rest of this. (2) 14 yo boy: Wait, there’s some of that salad left? (3) 16 yo boy: Hold on, I want some more too! I made this with plain yogurt, lemon juice, and frank’s hot sauce and didn’t have any scallions so I left that out. It was still delicious garnished with parsley and a bit of black pepper! I had to make this immediately when I saw the fresh and handful of handy ingredients! This was amazing! The dressing was surprisingly perfect with this dish although my daughter was skeptical since she doesn’t usually like mayonnaise. Combined with the lime, scallion, and sriracha, it works! This looks just so jummy! As a vegetarian I often combine avocado with Sriracha saus, and I use it literally everywhere (on toasts, bread, pasta..). I like the mix with the cucumber too and I’m definately going to try it! Also delicious with dill! Dillicious? OMG YUM. My husband and I could not get enough of it. Easy to make, too! Thanks for the recipe and I appreciate the suggested varieties. Delicious! Our toddler loved it! Thanks Deb! This salad was so good! Love cukes and avocado so this was definitely a good choice for me. I didn’t use scallions but instead used fresh garlic greens that I picked up at the local farmers market. I made this tonight and I could have eaten the whole bowlful myself. I followed the recipe but used mint instead of cilantro/parsley because I have so much in the garden. This is very satisfying, and incidentally a wonderful low carb dish. I hope the leftovers are good for lunch tomorrow, if it lasts that long. Made this after a long day at the pool during a DC heatwave. Let’s just say — you are not wrong. It is delicious and simple and exactly what summer needs. I made this salad tonight to eat as a side dish for corn fritters and it was awesome. So fresh and easy to put together! I loved the spicy mayo, I made more to dip the fritters in, it was amazing. Thanks for a great recipe! I made this with the added romaine and the lemon/ dill variation. I don’t know, maybe even though I increased the dressing volume, it just wasn’t quite right with the romaine. Tasted kind of bland. Will try again another time with just the cucumber and avocado. Just made this last night and am officially obsessed. Had it again for lunch today (added some homemade croutons) and can’t wait to make it again! Thankfully have 8 more cucumbers from the garden just need to restock my avocados. Thanks for a great recipe that’s simple and refreshing in this Midwest heat and humidity! Any thoughts about a dairy-free substitution for the mayo? Greek yogurt? I just saw a comment that answered my question. Thanks for a wonderful recipe, yet again! This caught my eye when I first saw it, but I didn’t make it then. It popped up again in Deb’s Monday email roundup this week, and kept nudging me until I needed a quick before-work dinner last night. So I put together a nice big bowl to have alongside some of my husband’s leftover chili… and finished it all. Oops! Of course, husband doesn’t like yogurt (which I used because I have A Thing about mayo), so I really didn’t need to save him any. Right? I must have missed it the first time around. Easy to add converts with my enthusiasm. SO GOOD!! Added chickpeas and used half mayo / half greek yogurt. Made for late breakfast and may make more for lunch, agree with other commenters this is addicting. Happy Spring! Wow! This could really be addictive. I made this as a lunch for one with one small avocado, 2 small cucumbers and only a teaspoon of mayo. Otherwise all the same ingredients. Mayo and avocado are a match made in heaven, but you don’t need much. Love this combo! Will def make this tonite. You should also try my similar new obsessive favorite: avocado and edamame bean salad (w just lime salt and olive oil). I whizzed it into a not-guacamole dip the other day and it was big hit. Made this today for lunch, but halved everything except for the scallion. I added a pinch of sugar to the dressing and finished the salad with an extra squeeze of lime and cilantro. My sister, mom, and I had it on sourdough toast. At first bite, I thought it was just perfectly fine but I liked it more and more as I ate it. My sister and mom were fans too. I’ll definitely be making this again!